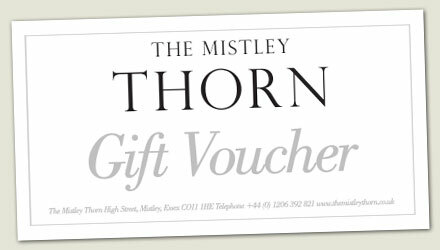 Great for birthdays, anniversaries, weddings and retirement, Mistley Thorn Gift vouchers are always a welcome present. Vouchers can be redeemed against meals, drink, accommodation, or all three. To buy online please complete the form opposite, then go to the checkout to pay for you purchase. The Voucher/s will be emailed to the recipient, if you would prefer to give a voucher in person please enter your email address in the recipients email field and have the voucher emailed to you. Alternatively you can purchase vouchers from the restaurant or by telephone on: 01206 392821.